KPGM 1500 AM broadcasts at 500 Watts during the day only. At sunset, we are required to turn off our signal to protect larger stations. The daytime signal reaches all of Osage and Washington Counties in Oklahoma. Chautauqua County and Sedan, Kansas are also easily covered. Parts of Nowata County in Oklahoma and Montgomery County in Kansas can receive a clear signal during the day. Because of the AM Band, many areas far outside our defined listening area can pick up KPGM depending on time of day, terrain and other interference. Our FM Translator at 99.1FM covers most of the 1500AM signal 24 hours a day. KPGM rebroadcasts its signal on our sister station KYFM's HD-2 channel. This gives listeners with an HD radio the ability to listen after sunset and before sunrise. 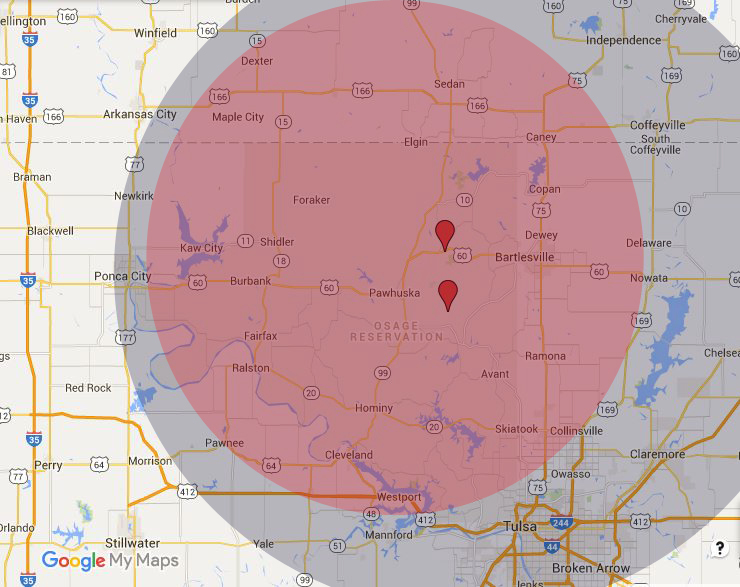 The HD-2 signal covers all of NE Oklahoma and much of SE Kansas, including Tulsa. HD Radio stations broadcast in clear digital quality to your local area making static, radio hiss and fuzz a thing of the past. Most new cars have an HD Radio and many desktop units are available. For more information on HD Radio and where to purchase a unit, visit www.hdradio.com.